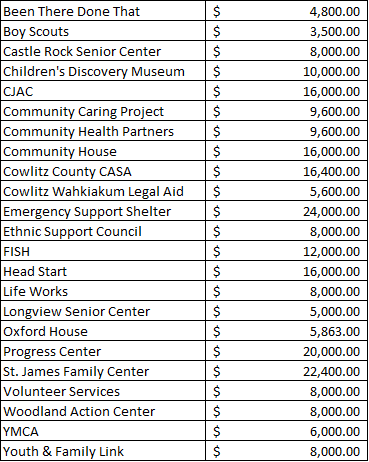 Longview, WA-United Way of Cowlitz & Wahkiakum Counties Board of Directors held their annual “Grant Night” event on Wednesday, April 11th, where they decided how collected campaign funds would be distributed among the applying agencies. The board and staff of United Way wish to thank all their donors who have made this a very successful campaign year. United Way awards funds based on cash in the bank as of the date of their Grant Night meeting. This is to protect all stakeholders since some pledges many not fully materialize in each campaign. Cash available to award was $250,763. The 2017-2018 campaign pledge total is $530,000, which is 92% of their $575,000 goal for the year. Money raised from that pledge total will continue to come in through next March. United Way raises money for human service needs in the areas of health, education and financial stability. United Way is pleased to report that a portion of the $530,000 pledge total includes a donor designation of $50,000 to apply towards specific youth development impact work. In addition, $37,366 of the pledge total is designated to specific non-profit agencies that donors selected. United Way is energized to report on a new program that will be revealed on May 1st to the public, which a portion of the designation funds are also allotted to. This new program will greatly support the early learners in our community. “Your United Way is taking steps to elevate itself to a new platform of service to the community, in providing greater impact within youth development with specific goals, outcomes, funding and collaboration, in addition to supporting critical programs that assist those in need in our community. We are excited to engage the community, our partners and our generous donors through this growth and development phase,” stated Brooke Fisher-Clark, Executive Director.